Sam Capra is living the life of his dreams. He’s a brilliant young CIA agent, stationed in London. His wife Lucy is seven months pregnant with their first child. They have a wonderful home, and are deeply in love. They have everything they could hope for…until they lose it all in one horrifying moment. On a bright, sunny day, Sam receives a call from Lucy while he’s at work. She tells him to leave the building immediately. He does…just before it explodes, killing everyone inside. Lucy vanishes, and Sam wakes up in a prison cell. As the lone survivor of the attack, he is branded by the CIA as a murderer and a traitor. Escaping from the agency, Sam launches into a desperate hunt to save his kidnapped wife and child, and to reveal the unknown enemy who has set him up and stolen his family. But the destruction of Sam’s life was only step one in an extraordinary plot—and now Sam must become a new kind of hero. Holy smokes! 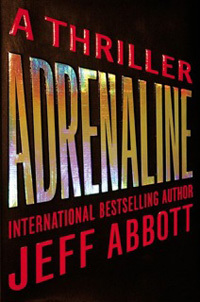 Where do I start with Adrenaline? This is the type of thriller I really enjoy. Not so complicated that I need a spread sheet to keep track of the characters and plots, but with enough twists and turns that I stay riveted to the read. I have to say that I thought the level of violence was pretty much necessary to make the story lines and plot believable. I liked Sam and the very pregnant Lucy from the beginning and was easily roped into their struggles. We all know that Sam's no traitor and Abbott knows that readers like to be tricked a bit, or the twists wouldn't be any fun. I did find some slow moving bits towards the "third act" of the story and I got a bit bogged down for a while, but not so much that I didn't want to finish the book. I have to say that Abbott's addition of the Mila character into Sam's quest was a huge hit with me. As with all books, some parts work better than others and I really enjoyed this character and how she and Sam interacted. I think Abbott has penned a fun, exciting book with Adrenaline and I look forward to reading Sam's next adventure. I happily give this book 3 1/3 stars out of 5! Find it at a bookseller!! This review copy was provided to me by the publisher in exchange for a fair and honest review. The Trailer for "HUGO" is out! NovelChatter now open for comments!